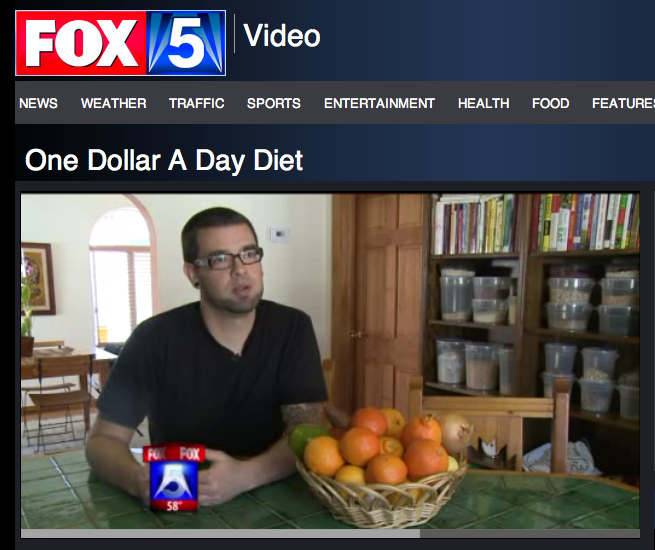 As seen on Fox 5. We did this interview on Sunday, and it ran later that evening, and will probably run again today. Click here to watch it! The Los Olivos dining hall at California Polytechnic University at Pomona is fascinating microcosm of the American food system, where in addition to healthy vegan options you can also find things like this: a bread just labeled "Yellow." Photo by Christopher. I never lived in a dorm. I never had a “meal plan” in college. And as a result I have never experienced or reflected on the daily impact of this process. Until now. In fact, the closest I ever came to eating food in a college dining hall was when I downed a small carton of chocolate soymilk at the University of San Francisco cafeteria nearly a decade ago. However, for the past week I have been lucky enough to eat at Los Olivos, the mess hall at California State Polytechnic University at Pomona. As a fellow of the Ahimsa Center, which focuses on the practice and study of nonviolence, as a part of the College of Letters, Arts & Social Sciences, I have been well fed three times a day. During this experience I have found that the lessons learned during the dollar diet project, and during our most recent experiments in eating have significantly changed my habits. I find myself asking for smaller portions from the food service staff, making choices based on nutrition guidance from the USDA, and avoiding foods high in fats and sugars. But in my suite, away from the brightly lit space, and public accountability of the college cafeteria, a package of Oreo cookies occupied a small piece of real estate on our kitchen counter. Yet the space these cookies occupied in my mind was far lager. I avoided them for the first couple of days. I felt that our study of Gandhi was a good reminder about the need for self-restraint. Yet the conversations late into the night gave way to deeper urges, and by one in the morning I was picking the chocolatey goodness from my teeth. During the following day’s lecture we briefly discussed the notion of “vows.” So today I have decided to take a vow to no longer eat prepackaged cookies. I feel comfortable with this little step, and find that this will keep my sweet tooth on a leash in a simple but practical way. I will limit my sweet eating to specially home baked treats from family and friends, and rare outings at restaurants. It will be like taking my sweet tooth out for a walk every now and again instead of letting it roam the neighborhood. I will replace this urge with healthier options like strawberries, melon, and grapes in the dining hall while I remain at Cal Poly. These succulent options have been readily available, as have decent vegan options at each meal. According to Dr. Tara Sethia, founder of the Ahimsa Center at the University, this is one of the things she has spent the last few years developing. Her commitment to nonviolence extends beyond the classroom and the study of Gandhi, and into the cafeteria where all students have the option to practice nonviolence (at least in eating). Every day there has been a delicious nonviolent option, from curry to chili, and yesterday the grilled teriyaki tofu, steamed vegetables, and rice more than satisfied. The salad bars also stand in the center of the dining hall as a testament to student’s interest in leafy greens. However, the standard fare is far from diverse: corn dogs, burgers, pizza, rows of sugary cereal dispensers, and liquid sugar flowing freely from soda taps. This contrast is a good representation of the current food system in the United States. Where healthier, more sustainable options are available if you make a concerted effort to find them among the faster foods. This is where Gandhian self-restraint comes into play. In my case with the Oreo’s, it may take something like a vow to eat better. P.S. I am doing a new mini-blog during my stay at the Ahimsa Center. It’s called “Going Gandhi” and will document some of my experiments in truth as related to my study of nonviolence. PPS. Speaking of sugar…Kerri’s sister has started a cake blog here. Her stuff is artful and tasty, so check it out.